Here is another wonderful CD from Mr. I and the Rainbow Singers. 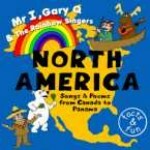 These songs were originally done to coordinate with Sunnygate Montessori School geography curriculum. We are very happy to have discovered them. These are some great songs that would be a wonderful addition to any study of North America. 1.HO HO WATANAY/ LONG WING FEATHERS (Traditional Native) There is lots of Native material on this CD. It begins with a feeling of the great outdoors, expansive, a sense of adventure. Great tunes to teach the kids. 2 NORTH AMERICAN COUNTRIES Gary lists the names of all the countries of North America. Yes, we have included Greenland, even though it belongs to Denmark. Central America and the Caribbean countries are included as well. 3 FIVE GREAT LAKES A simple song teaching the names of the Five Great Lakes. 4 SALUTE Hang on tight! A wild adventure through the woods and over the rapids in a canoe with Etienne Brule and Canada’s other early fur traders. Used by permission from Susan Jarema of Googol Learning. 5 USA STATES: Gary has outdone himself this time. Imagine, a song that lists all the states of America in the order in which they joined the confederation. Phew! Used by permission from Susan Jarema of Googol Learning. 6 MEXICO: A fun song to teach a few phrases in Spanish language. Plus a few interesting facts about Mexico. 7 FAMOUS PEOPLE Great song listing some of the famous people from North America and things they did. From Benjamin Franklin to Sitting Bull. 8 RIDING ON A HORSE: What would a CD on North America be without a couple of cowboy songs. I’ve been teaching them in my classroom, and of course, the girls insist they are cowgirl songs. Have fun making the horsey sound. 9 OLD CHISOLM TRAIL (Traditional) Hang on tight. We must herd the cattle to town. 10 ANIMALS OF NORTH AMERICA Mentions lots of animals and creatures living in North America. Watch out for the skunk! 11 BEAR FACTS One of Gary’s famous silly stories. Is that sound Mr. I, or is it really a bear! 12 POLAR BEAR A fun song mentioning polar bears. Great classroom song. 13 ARCTIC HABITAT: A short poem describing animals that live in the arctic. 14 BOY AND WHALE A cute song about a boy who befriends a whale. They teach each other very important things. 15 SALMON SONG: A song that teaches the names of the different types of salmon. 16 HAIDA, SALISH: A great teaching song about the Westcoast Native tradition of the Potlatch. 17 TOTEM POLE POEM: (Author Unknown) A wonderful native poem. Who is chasing who?